← How to Integrate Twitter into WordPress Comments? It looks like Firefox 3.1 is going to be delayed in it’s release until the second quarter of this year. We still have some exciting new Firefox extensions to look at this week. VideoSurf Videos at a Glance: As the name implies, this extension is a great one to have for those who watch a lot of online videos. For eg. you can make HD-compatible videos to play in high quality by default. Moonlight: Missing out on running Microsoft’s Silverlight powered apps on Linux? Moonlight is an open source implementation of Silverlight for Unix systems. LinkExtend: Consolidates a slew of web site information services into a single extension – you get quick data on Pagerank, company ethics, malware checks via Web of Trust, McAfee SiteAdvisor, Google Safe Browsing, etc. Facette Delicious Connector: MITs Haystack group has come with an innovative way to view your delicious bookmarks by organizing tags in your account into facets. It also provides an enhanced version of a tagging tool. As always, check your installed add-ons and remove the ones you haven’t used in a while. You can keep adding new and fun add-ons as well as keep your Firefox running zippy! I love Greasemonkey Firefox Extension and I am going to feature a cool Greasemonkey script every week. Thanks to @StephenCronin for the tweet on this one. Real time Twitter Search Results – We are turning to Twitter more and more for real time news. This GM script adds the top 5 Twitter search results for the term you are Googling for. 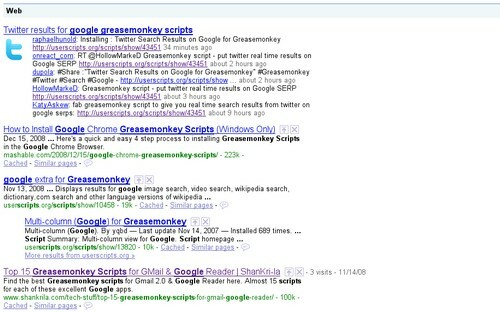 Check out some of the best Google Greasemonkey scripts here. Gradient iBlu is another cool dark theme with shades of blue blended nicely in various places. It’s kind of modern as well as will fit nicely with your dark desktop theme. I will be back with more cool Firefox extensions shortly. In the mean time, you can browse the other posts in this series or go straight to the Top Firefox Extensions list to find the best of the best. the extension are cool , i already looked for extension like this for a while. Im looking for an red-grey theme u got one? Very cool list of addons for FF. i like the moonlight extension is cool, and thanks for all these themes. If you like IE8’s Accelerators feature but don’t want to give up Firefox (see https://addons.mozilla.org/en-US/firefox/addon/10722 ). NEWS ALERT (and shameless plug): KallOut Accelerators for Firefox was shipped in the Firefox Public Directory only yesterday (March 5, 2009). Since KallOut for Firefox works as a browser add’-on, it is available for Mac, PC, Linux and since KallOut for Firefox is not a Microsoft product, it features all the best-of-breed sites in its context menu vs. a suite of Microsoft-only default offerings. I encourage you to check it out and predict that you will come to love its “BestGuess” search suggestions which are at the top of KallOut’s context menu that lists each of the sites that the user can send their selected text to as part of a search term. This new category of “selection-based search” (see http://en.wikipedia.org/wiki/Selection-based_search) has the possibility of becoming as important as search toolbars which now account for 10% of all searches (NOTE: roughly $2 billion in CPC revenue is derived from searches that start in search toolbars). In the same way that search toolbars allow consumers to search faster by avoiding going to Google’s home page, KallOut takes search outside the box by allowing you to search using only your mouse. Please try the product out and see if you don’t like it much better than IE8’s accelerators. And, once you’re comfortable with it in your Firefox browser, you can try out the Windows desktop version of KallOut that gives you the same functionality over IE6, IE7, Chrome, Word, Outlook, Powerpoint, Excel, Adobe Reader, etc.